There's no better state to pick for becoming a CPA than Oregon. It's a beautiful place to live and the I-5 corridor is growing by leaps and bounds. You are sure to find a lucrative, successful career as well as a rich and rewarding lifestyle. The road to becoming a CPA is nearly as difficult at the Oregon Trail, however. There are many specific requirements that must be met, and loads of hard work is involved, too. Since Oregon has its own unique approach to CPA licensure, this document is here to help you navigate your way clear through to your CPA license. To become an Oregon CPA demands a lot intellectual and academic rigor. You must hit the books early, late, and as often as possible. The general requirement is 150 semester hours of college or graduate work. That should include matriculation with at least a bachelor's degree and a major concentration in accounting. The state's minimum requirement is 24 hours of accounting courses and 24 hours of business-related coursework. Confer with your academic in the accounting department to ensure that your business electives are recognized by the Board as being business-related subjects. Keep in mind that courses taken at the master's level likely carry more hourly clout than undergraduate coursework. Interestingly enough, Oregon still offers a way for those with no college credit to become a CPA. If you have graduated with high school diploma and have two years of experience in public accounting, you are eligible to sit for the CPA examination. Your supervisor should be prepared to sign off, in a notarized document, for all of your experience. The board will contact them individually to verify your tenure in accounting. While this is an intriguing option, confer with your employer as to how you can be best prepared for the exam. Since the pass rate for the exam is around, or below, 50%, you may need to take some college-level coursework to prepare. At a minimum, seek out an accredited review course for the test. This will help solidify your knowledge and provide you with college credits that you might use later. To sit for the CPA exam in Oregon, the Board requires that you be fully prepared with 150 semester hours of college work, including a baccalaureate degree, or a high school diploma and a minimum of two years working full-time for a licensed CPA. If you take the academic route, you will also need to complete an experiential portion later. However, your scholarly work should ensure that you are fully prepared for the exam and your future practice in accountancy. To satisfy the board your official transcripts should reflect 24 hours studying accountancy and 24 hours of general business coursework. Your accounting courses should be upper-level courses. That is, introductory courses will not be included when the Board reviews your transcript. This is often standard practice when universities qualify students to graduate in a major concentration. Thus, if you can receive the major there's a good chance you've satisfied the Board. Your business-related courses can include courses such as Business Law or Business Ethics. You would be well advised to take at least one course that covers business communications. The Business Environment and Concepts portion of the four-part CPA examination includes 3 written items. When you have completed all of the required 150 semester hours (or 225 quarter hours), you may apply to sit for the exam. Your application should be accompanied by a payment for $150 for your first time. Returning applicants pay $50. Payments should go through the NASBA website, or by providing a credit card number via phone. On your application, you will indicate the sections of the test that you are prepared to take. Only list the section(s) for which you are fully prepared. Your application should also include your name exactly as it appears on your driver's license or other state identification. Otherwise, the testing center is likely to refuse your reservation for the test. If there is some error, you can contact the Board and request an amendment. A passing grade on each test is 75. Once you have completed the test, your scores will be available for private viewing on the NASBA website. Once you have passed the academic and examination portions of the road to your CPA licensure, you will need to put your knowledge to the test in a real-world accounting firm. 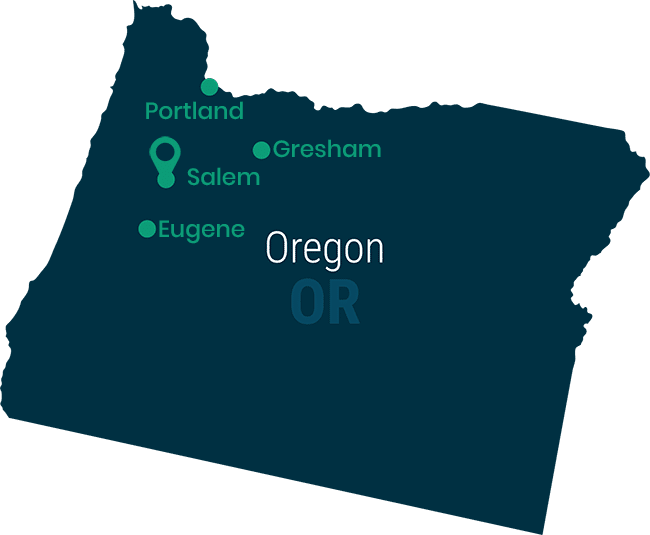 Oregon requires one year of full-time employment under the direct supervision of a licensed CPA, PA, or chartered accountant. If you work part-time, you must complete 2,000 hours to complete your application. Your supervisor will be asked to verify your experience in a separate communication. The general requirements for an Oregon CPA license are in four parts: experience, education, ethics, and examination. If you have 150 semester hours of college (or greater) work, you need one full year of full-time experience. With a high school diploma, you must work for a minimum of two years on a full-time schedule. For the education portion, you can simply stop your education after high school, though it's strongly recommended that you pursue a baccalaureate degree. The Board requires 150 semester hours that include 24 hours in accounting courses and 24 in business, or related, coursework. You must also take and pass an ethics course, as well as all four parts of the CPA examination. The ethics portion can be satisfied in one of two ways. You can take the AICPA's professional ethics course or the exam created by the Oregon Society of CPAs. Once you have received your CPA license, you will need to continually maintain it with further education. Oregon is not alone in requiring that its CPAs complete CPE hours every year. For every two-year period, you should complete 80 total hours. Every year, however, you must complete a minimum of 24 hours. While you will mostly take courses that apply to accounting, attestation, taxation, and similarly technical courses, you must also take four CPE hours focused on ethics. The Board website has a lengthy list of of registered sponsors who can provide Board-approved ethics instruction. Your other CPE units can be acquired by taking courses through professional organizations, colleges or universities. The board will determine the hourly value of your work on a program-by-program basis. Note that the board does offer CPE waivers for military service, illness, or individual hardship. You may not, however, waive the CPE requirements for more than three years. If you need more time, and desire to return to the profession, consult with the Board. Your career as a CPA is bound to be fruitful and a large part of the continuing success of the state of Oregon. Your hard work will be the basis of a deeply rewarding career.